Year 4 have learnt the model text ‘Elf Road’, looked at the story pattern, analysed the features, created writing tool kits and have now completed a warm write of their own version of a portal story. Everyone has done an amazing job and we cannot wait to read the outcomes of the hot write next week. 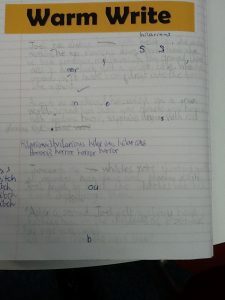 Dominic is really proud of his writing so far – have a read of his first two paragraphs. Joel had always been curious. One sunny morning, he was running down Spook Street when he saw something mysterious. On the ground, there was a horror book with a golden title. When he opened it, it made him drift into the book like a ghost. As fast as an asteroid, he crashed on a green world. Around him, there were glowing, green houses with spiders and huge sapphire dragons with red, gleaming eyes. Thousands of witches were shooting spells at wooden mannequins and phantom ghosts. Joel tried to touch the witches but his hand shot right through them.